Aqueous cream is one of the most widely available emollient dry skin creams. Before my skin got bad, I often used it as a general everyday moisturiser. However I always found it very thick and heavy, especially in the summer. Although it would appear to be all rubbed in, as soon as I got warm I'd feel it all melting off my face. Also if I had a shower after using it I could feel it all slide off my skin meaning it hadn't really all soaked in. One of the best things about aqueous cream is the price. My local chemist sells it for £2.50 but you can get it in places like Quality Save for only £1. I've tried using it more recently after my massive eczema flare up and now the aqueous cream stings my skin, particularly on my face, so I've stopped using it. As it's so thick it takes a lot of rubbing in, which cannot be good for skin that is easily irritated because of eczema. When researching for this post I came across this recent article that explains that the cream was actually developed as a soap substitute and is not intended to be left on the skin as it contains a detergent! This explains the stinging/ burning :s It seems doctors have fallen into a habit of recommending the cream as a moisturiser for eczema skin but really it should never be used this way. Imagining rubbing a mild detergent into your eczema and leaving it there - it's no wonder that it made my skin burn. If any cream you use makes your skin burn/ sting/ feel hot STOP USING IT IMMEDIATELY. Even if it's something that says it is suitable for eczema/ sensitive skin or that your doctor has prescribed you. In fact, I would go and wash it off with cool water straight away, dry it very gently by patting with a soft towel and just leave your skin to calm down without putting any kind of product on it, at least until the following day. Aqueous cream is a soap substitute and can be used in the shower in place of shower gel. If you stop using it as a moisturiser because it's making your eczema worse you can use it up as a body wash to save you throwing it out. You wash with it the same way you would use shower gel - rub a small amount into your wet skin then wash thoroughly off again. You only need a tiny amount otherwise you can make your shower very slippery or clog your plug hole. Don't expect it to lather up and give you lots of bubbles like shower gel does though; you won't get this effect from aqueous cream. NB If the cream made your skin sting I wouldn't recommend using it to wash with - at least until your skin has calmed down and you have got your eczema under control. I've got some patches of eczema on my legs - just on very small isolated areas. I know that this is aggravated by shaving my legs, despite using sensitive shaving foam and the razors with the moisturising strips. I know that shaving your legs is never going to be any good for dry skin but I thought I would try the aqueous cream in place of shave gel as I already had it in the shower - and it worked really well. The thick cream clings to your legs so won't just wash off as soon as it gets wet and you don't need to use very much at all. The razor glided really well with it and it did actually leave my legs lovely and smooth. 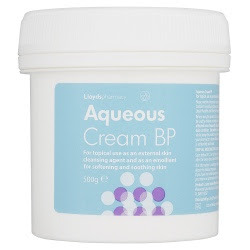 If you're giving up aqueous cream as moisturiser (which I would recommend! ), this is another great way to use it up. Aqueous cream is very easy on the pocket - but I would not recommend it as a cream for sensitive skin. I'd say steer well clear! If you do not have sensitive skin you could use it as a heavier winter cream or a night cream rather than a day cream but I'm sure you could find an alternative moisturiser that is detergent-free. If you already have some I would recommend using it instead of soap, shower gel or shaving cream, but only when your skin isn't badly flaring. Personally, I prefer to wash with a coconut oil based soap or an anti-bacterial soap such as MediMix, and use coconut oil for leg shaving. I hate throwing stuff out, so use up the product in the shower by all means, but then don't buy it again! So far the best moisturiser I have found to use instead of aqueous cream is Vaseline Intensive Rescue Moisture Locking Body Lotion. I have been using some Aveeno hand cream at work and really like it though so I have high hopes for their body lotion as well.